Best Prices Maintenance Repair Parts 19703. New Castle County Burke Landscape Supply. Located near the Delaware Line you will enjoy one stop shopping. Get the Maintenance parts you need in addition to bulk mulch. First of all, there is no need to go anywhere else for your parts needs. We offer reliable Repair and use genuine parts to ensure quality repair. 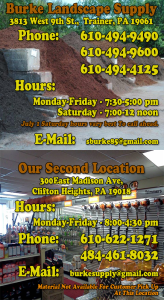 Burke Landscape Supply in Trainer, PA has two repair service center locations conveniently located to serve all of Delaware County, Chester County and parts of Northern Delaware. Our Trainer, PA location is a short drive from New Castle County, DE. Location should be just one factor to consider Burke Landscape Supply when your looking for Lawnmower Repair Parts and Maintenance in New Castle County, DE. Our professional and reliable services for commercial and residential clients is untouchable in the area. Best Maintenance Repair Practices New Castle County, DE 19703 is available! Keep your equipment running and operating efficiently. Using Best Maintenance Repair Practices is the best way to keep your equipment maintenance costs down. We sell and service your landscape equipment. We offer genuine maintenance repair parts. Call on Burke Landscape Supply to meet your STIHL, RedMax, ECHO, FERRIS repair parts needs. Highly Recommended Burke Landscape Supply can Maintenance & Repair your mowers, trimmers, blowers and other equipment to standard manufacturers specifications. Good quality tools are essential in the proper maintenance of your landscaping needs. We service ENCORE, eXmark, Ferris, Echo, RedMax and STIHL Lawn and Landscaping tools. Come to us for your maintenance Repair Parts New Castle County! It is well worth investing in a few high-quality tools that will last years. Great pricing on landscaping tools & equipment, landscape contractor equipment is available in New Castle County, DE. Burke Landscape Supply has the knowledge of getting projects completed right. We offer rental and carry a vast selection of power equipment to complete outdoor projects. We provide Repair Service on most power equipment. Seasonally we have a full line of winter supplies and maintenance parts for your snow plows and salt melt. Whether you’re a landscaping contractor, lawn maintenance company, using landscaping specialty tools like industrial blowers & fans, hand tools, etc., look to Burke Landscape Supply to find quality replacement parts for all major manufacturers. We carry residential and commercial mower parts and accessories. Choosing Burke gets you instant access to the best products from eXmark, Ferris, Echo, RedMax and STIHL.